MVVA, the winning design team in the Arch grounds competition, proposes closing Washington Avenue from Memorial Drive to the Mississippi River. The competition jury, on the other hand, had very strong feelings towards keeping the road in place. 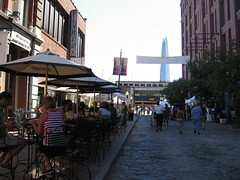 Washington Ave currently serves as one of the primary means of accessing Laclede’s Landing and the Arch parking garage. But is it actually needed? Laclede’s Landing. // MBK (Marjie). Washington Ave lies on the border between Laclede’s Landing and the Arch grounds and is one of the principal gateways into both destinations. For the Arch, the memorial’s 1024 space parking garage lies on Washington Ave; for Laclede’s Landing, Washington Ave is one of the few roads into the area. The Arch parking garage also serves many of the workers and patrons of Laclede’s Landing. Given the reasons above, it should not be surprising that the opinions expressed in the competition summary report were generally against the idea of closing Washington Ave. What is surprising is how strong those opinions were. There are serious concerns with the elimination of Washington Street and the probable routing of traffic through Laclede’s Landing. Closure of Washington Ave from Memorial Drive to the river is a mistake. The reasoning for that recommendation is not clear. Without Washington Ave, there’s no question that vehicular access to Laclede’s Landing and the north side of the Arch grounds would be reduced. Changes to the streets of Laclede’s Landing would have to be made to accommodate different traffic patterns. On the other hand, the pedestrian environment would improve greatly with the melding of the Arch grounds with the Landing and a significantly simplified intersection at Memorial Drive and the Eads Bridge. With Washington Ave in place, vehicles would be able to continue to access the Arch parking garage without going through the Landing. And since the parking garage will be replaced with an underground version, accessing the Arch grounds from Laclede’s Landing should become a rather simple and pleasant experience, an enormous improvement from the current connection through the existing parking garage. In the end, Washington Ave can probably be removed without too much harm. But either way, connections from Laclede’s Landing to downtown should be restored to lessen the impact to the Landing’s streets and reduce its isolation: Lucas, for example, should be restored to 3rd St and Morgan St should be connected to 4th St. It will be interesting to see what changes MVVA makes at the competition sponsor’s request.